This week, we have already discussed how Miu Miu’s campaigns have pioneered a new wave in fashion advertising through offering lifestyle imagery that is simultaneously aspirational and relatable. Right on cue, they released their Autumn/Winter 2015 campaign shot by Steven Meisel, with accompanying notes that inform us the series (titled Subjective Reality) is a "rejection of overly determinative technique and academic notions of composition. The street photograph represents a more immediate, engaged, lived art... That unstudied sophistication." It is, explicitly, liveable aspiration – and it is brilliantly appealing. Here, we look at the lessons we can learn from the campaign; from modes of transport to cultural referencing. While the collection clearly references the eighties with Princess Diana frills and Siouxie Sioux patents, Mrs Prada's allusions extend far beyond the immediately obvious. What often marks her collections as just so brilliant is their underlying messages; as collaborator and illustrateur sonore Frederic Sanchez explained, the inspiration actually stemmed from "Africa seen through the eyes of someone European," a throwback to the afrobeat-meets-electronica compositions of people like Talking Heads and Brian Eno. The plasticky artifice of faux-croc fabrications wasn't just a comment on punk-meets-consumerism: it was also an exploration of an era of new cultural interepretations. As Mrs Prada once told us, "Study fashion, study movies, study art and after that study yourself" - and a studied approach to cultural referencing is one of the dominant lessons we can learn from her. "The actresses meet that gaze, at times almost defiantly, as if interrupted mid-sentence by the intrusive lens of the photographer," explained the accompanying notes (a campaign with accompanying notes!) 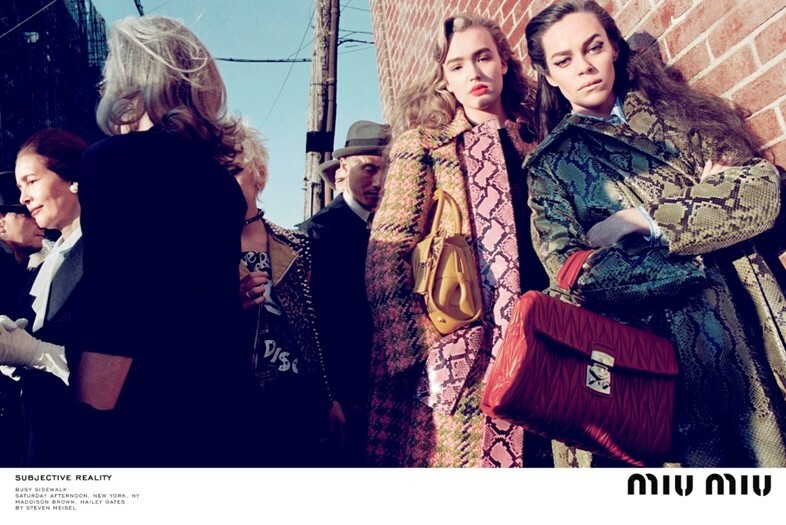 – and Meisel's documentation of Miu Miu's girls shows them as staunchly assertive figures. No passive femininity here; they stare down the lens, stand solidly amidst flurried passers-by, self-assured and assertive. Miu Miu's woman is always an empowered one and Mrs Prada is famed for her feminist approach to fashion, art and politics alike – but never before has her campaign depicted the models quite so formidably. There was nothing immaculate about the collection's presentation on the runway; punk eyeliner was heavy, up-done hair often slightly dishevelled and a little stringy. 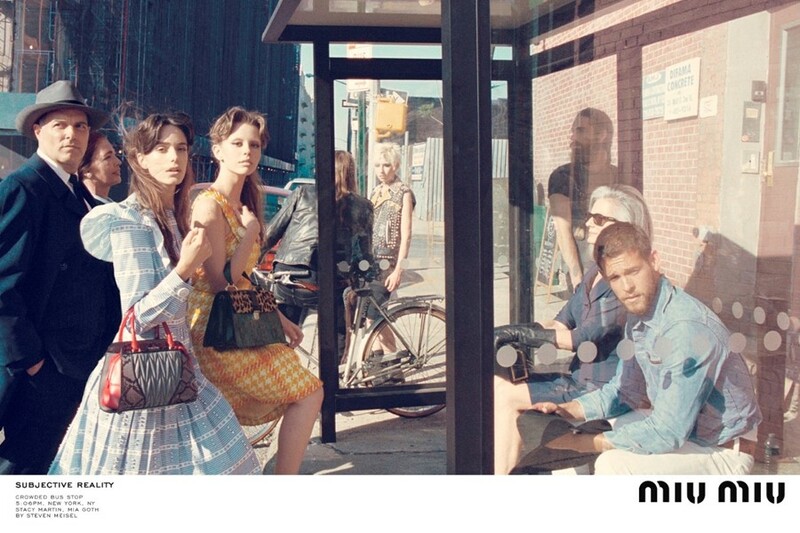 The clothes were made to be lived in and were worn by a girl who could have been mid-way through a night out at Taboo or Bowery Bar – a girl who, as the campaign shows us in 2015, waits at the bus stop rather than taking a cab. Miu Miu's girl isn't prissy or pristine; she's all about public transport and morning-after hair – a relief to those of us saving our taxi fare for the shiny handbags. For S/S15, the Miu Miu runway was walked to the soundtrack to John Waters' Female Trouble: they were fifties good girls gone bad, wearing some of the same fabrics and silhouettes that were reincorporated into A/W15. Meisel's campaign reminds us of this girl gang appeal; Maddison Brown, Hailey Gates, Mia Goth and Stacy Martin slouching on a bench are a wonderfully intimidating group, and form a painfully cool club that surely everyone wants to be a member of. Sigue Sigue Sputnik soundtracked part of the show's auditory mashup, and their lyrics "Pleasure is our business" seem to summarise the atmosphere of the collection. 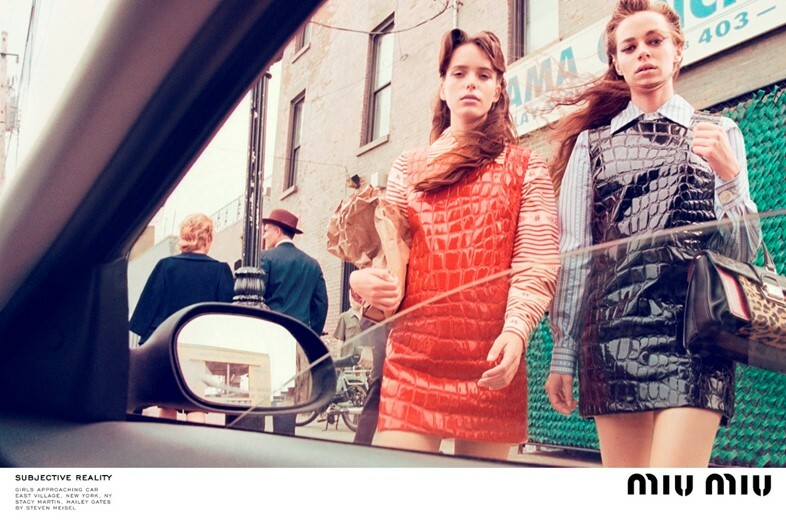 If we can learn anything from the faux-candid snapshot of a heady makeout session on a New York street corner, it's that the Miu Miu girl knows how to enjoy herself; "We started with everything that is big and fun," said Mrs. Prada after the show and, if the lesson she's teaching us is that the defining characteristic of a Miu Miu girl is one that knows how to have a brilliant time, then that's one we're happy to learn.